Engineer from the road near Purgatory. While my winter has been mostly boring, I have done a few things. 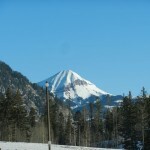 Engineer Mountain is neither particularly high (12,960′), steep (Colorado class 3) or difficult (2500′ from Coal Bank Pass in a bit over 2 miles). 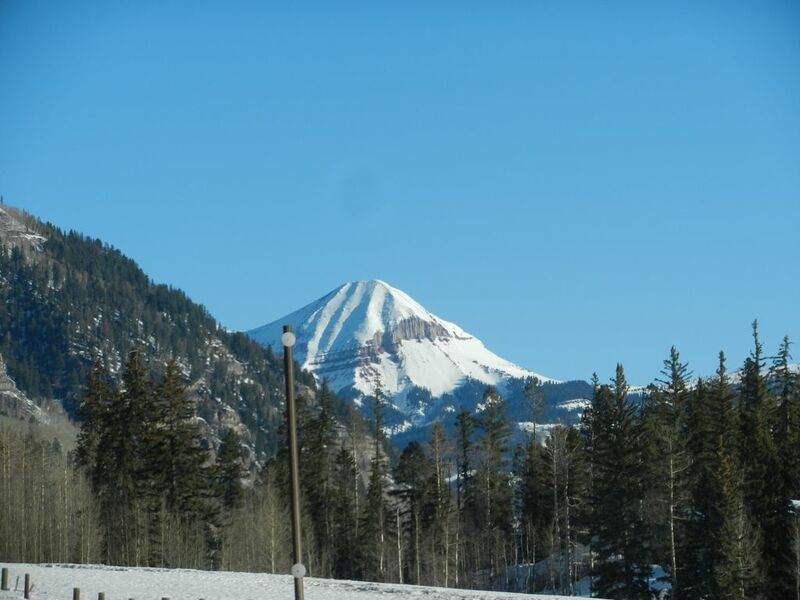 But it has a fair amount of prominence, and is a landmark on the drive between Durango and Silverton. I have passed it countless times, and doing it in winter would make it a bit more interesting. I woke up at 3:00 AM, and was at the trailhead by 8:30. Some University of Montana students have been conducting a study where they give people GPS units to carry on their hikes and leave in boxes at trailheads, and the students themselves screamed into the parking lot right as I was getting ready. If this is their means of distributing the units, I can’t imagine their study will be successful, but I was happy to participate. 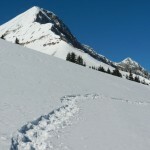 After a bit of meandering, I found the expected snowshoe track and started plodding through the forest. 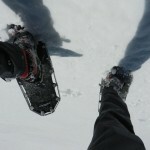 The snow was perfect for snowshoes: too soft for boots, but not soft enough to sink in more than a couple of inches. The trail wanders up a drainage to the northeast of the mountain, passing a small buried lake on the way. As I finally emerged from the trees, I encountered a guide and client playing with avalanche beacons. I think the game was to make a big hole, bury the beacon, then dig it up again. 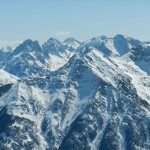 Though there was a mountain just 1500′ above them to the southwest, they didn’t seem interested in climbing it. 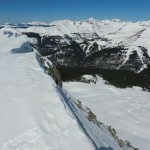 I climbed the ridge more-or-less directly, staying out of avalanche gullies lower down and more or less on the crest above. I managed to make my life harder than necessary by climbing a short 4th-class chimney through the first step, but the rest of the way was just steep snow. Sometimes I could find a good crust, even “front-pointing” in my snowshoes, but other parts were just a wallow through the soft stuff. The summit was almost perfectly calm, with impressive views all around, including a few of the hard-to-see Needle range (Sunlight, Windom, and Eolus), and the Grenadiers (Arrow and Vestal). After taking some pictures, I made a makeshift bed from my snowshoes and gaiters, and managed to catch up on an hour of sleep. The return trip went quickly, and I only met two other snowshoers who were, absurdly, camping out in the woods to climb the peak the next day. 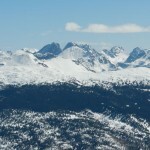 View across summit to NW. 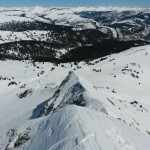 View back down NE ridge.